Santa’s Here Early! | ¡VidaMaz! I know many of you wonder why we live on the malecón. Isn’t it noisy? Yes, it is! And we love it! We get a parade at least once, sometimes several times a week. It is wonderful. Certain seasons of the year, we get several parades every day. This evening, just as we were winding down from work, who should show up but Santa himself? I guess he got cold at the North Pole! 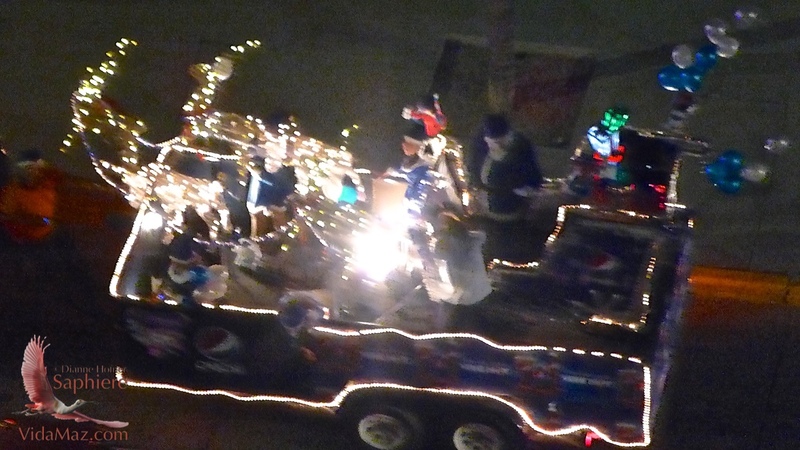 It was a few Pepsi trucks, and Santa and his elves were handing out soda to those along the malecón. Now I hate that sugary sodas are causing diabetes and obesity in this country, but it sure was making everyone happy to see the jolly old man, and it sure was a nice transition from the work day to the evening for Greg and me. Bless you, Santa! By the way, have you been wondering where the city will be holding the Feria de Navidad/Christmas Fair that they’ve held the last few years in the Bosque/city park? It will be December 19th through January 6th, 6:00-11:00 pm, at Salon Bacanora on Rafael Buelna. Entry, all rides (10 child rides, 9 family rides, and 3 “extreme” rides) and artistic presentations are completely free of charge. Refreshments will be available. Take the kids and grandkids! It’s always been a lot of fun. ← Definitely Feeling like the Holidays!